UIPM President Dr Klaus Schormann visited the Training Centre in Shanghai and discussed with Mrs Jun Qiu (Exercise Physiologist of Shanghai Research Institute of Sports Science) and Zhenhua Qian (2005 world champion) the future possibilities for athletes and for collaboration with the UIPM Training Academy in Wuxi at the Senior High School. 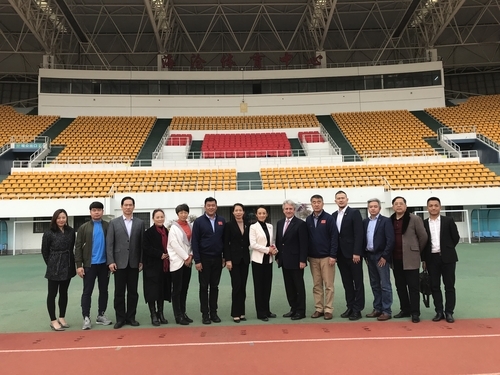 Together with UIPM Secretary General Shiny Fang, President Dr Schormann had various meetings in Xiamen on January 7/8 with the UIPM 2020 Pentathlon World Championships Organizing Committee. 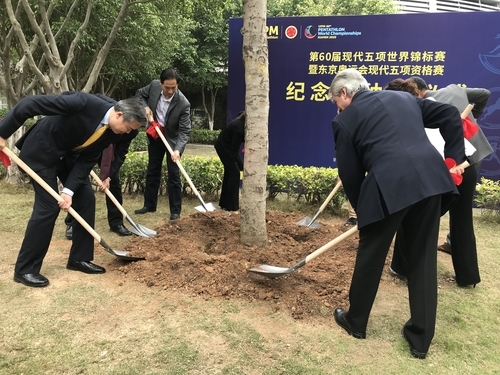 They discussed preparations with representatives of Xiamen Municipal Committee of the Communist Party of China, the Xiamen Municipal Bureau of Sports, the Economy of Sports Industry Division and the Vice Mayor, Mrs Guirong Guo from Xiamen Municipal People’s Government. 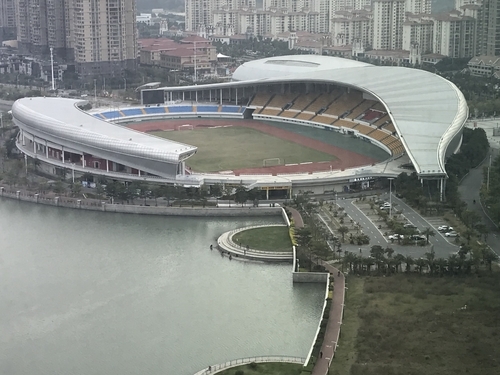 They visited the main stadium and other facilities. 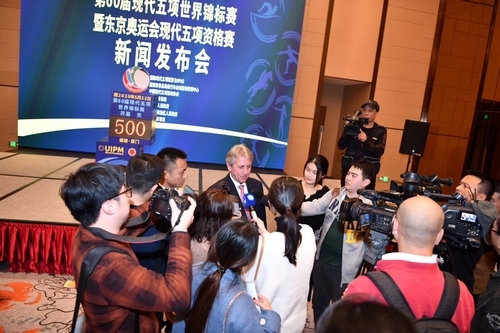 On January 8, the UIPM President attended a press conference and briefed TV and print media about the structure of UIPM and future steps for the development of Modern Pentathlon and all UIPM Sports in China and underlined the importance of the UIPM 2020 Pentathlon World Championships in Xiamen as the last major competition before the Olympic Summer Games in Tokyo 2020. Mrs Fang, Mr Weimin Sun (Party Secretary of Bicycle and Fencing Sports Management Centre, General Administration of Sport of China), Mr Bin Zhang (Director of Chinese Modern Pentathlon Association) and Mrs Guirong Guo (Vice-Mayor of Xiamen) delivered speeches expressing the importance of the championships for the region and for China. Together they kicked off a “500 days to go” countdown. 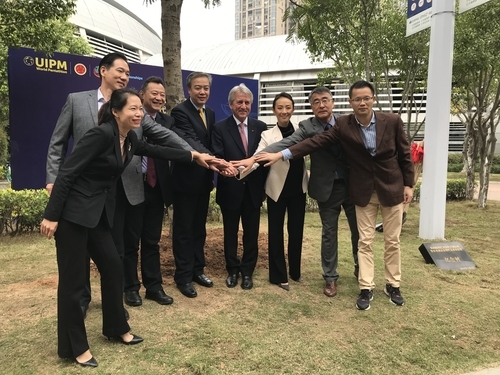 After the press conference, President Dr Schormann joined officials to plant a flame tree, traditional to the Xiamen region, in front of the stadium where the championships will take place as a symbolic gesture to the heritage of Pierre de Coubertin, the founder of Modern Pentathlon. President Dr Schormann attended the opening ceremony of the Handball World Championships and the opening game, which saw Germany take on the united team of North and South Korea, in presence of IOC President Dr Thomas Bach, International Handball Federation President Dr Hassan Moustafa and some Presidents from other International Federations. 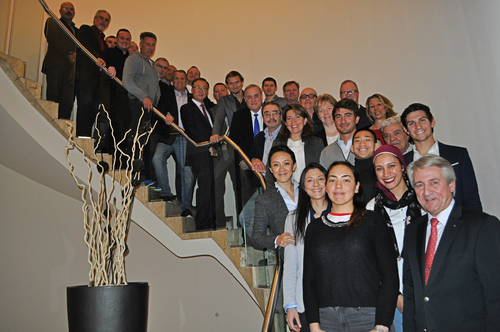 On January 11 he met with representatives of the Modern Pentathlon Training Centre in Berlin. 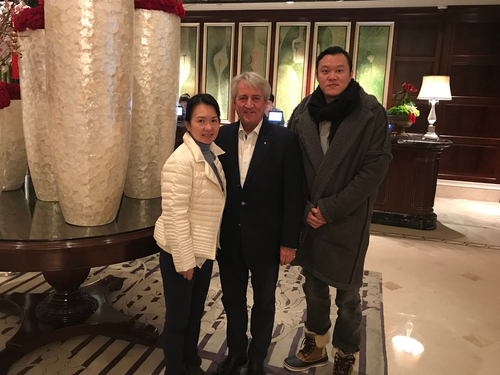 The UIPM President met on January 13 with Pierre Portmann to discuss sponsorship partnerships for the coming two years until 2020 and the option of an extension until 2024. 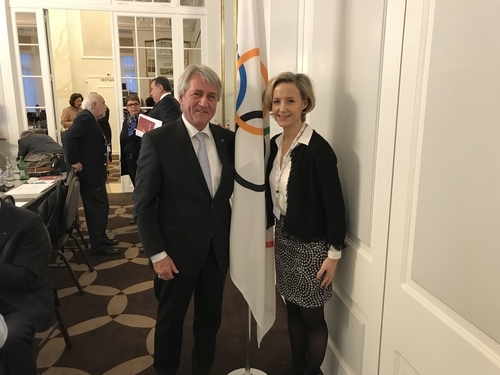 In his capacity as Member of the IOC Commission for Culture and Olympic Heritage, Dr Schormann attended the annual meeting, chaired by IOC Member Dr CK Wu, on January 14. The main themes were feedback from the Olympism in Action Forum (which took place before the 2018 Youth Olympic Games Buenos Aires), UNESCO Intangible Heritage Programme, Olympic Solidarity, NOCs Culture and Education Champions, IOC Art and Culture Strategy, Culture Programmes in Tokyo 2020, Panasonic Center in Tokyo, YOG Lausanne 2020, Olympic cultural institutions and network, IOC Heritage Management and finally the Pierre de Coubertin Foundation. The IOC President briefed the Commission Members about the current political and financial landscape of sport and focused, based on the IOC Olympic Agenda 2020, on future actions to guarantee fair conditions for a clean sport and gender equality. He also briefed Members on preparations for Tokyo 2020 and Beijing 2022. The UIPM President invited UIPM’s Equipment Commission, Athletes Committee, Technical Committee and Coaches Committee to a joint forum where he briefed all members about the main decisions of the 2018 UIPM Congress, the sport-political situation and the role of UIPM in the Olympic movement, and gave instructions for the coming season. The commissions and committees held separate meetings and then came together to share the main proposals. Secretary General Shiny Fang coordinated the meetings and joined President Dr Schormann and Treasurer John Helmick for a working session about finances for the next two years. They discussed financial operations for the main UIPM competitions, seminars and the financial strategy for development projects. 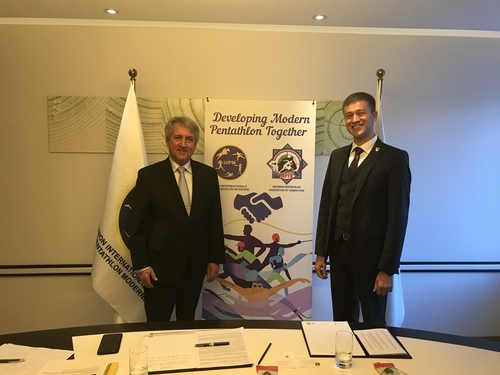 On January 19 Dr Schormann met with the newly-elected President of the Modern Pentathlon Federation of Uzbekistan, Bakhromjon Gaziev, who briefed the UIPM President on new steps for a pentathlon movement in Uzbekistan. 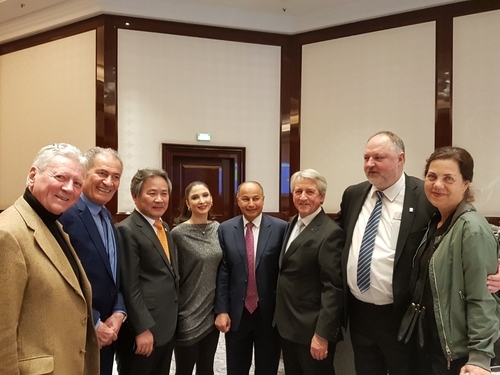 The NOC and Government are already supporting new ideas for the future and UIPM will provide strong support to the newly-created federation to enhance activities in Central Asia. 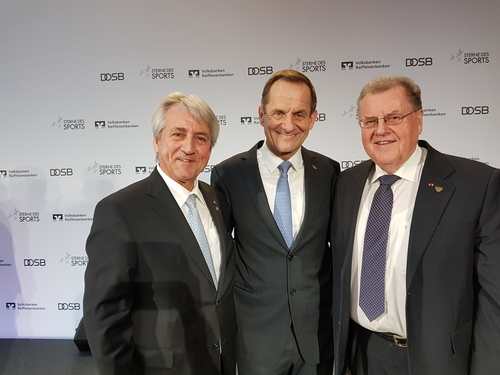 The UIPM President took part as an honoured guest in the ‘Sterne des Sports’ award ceremony held by the German Olympic Sports Association (DOSB). 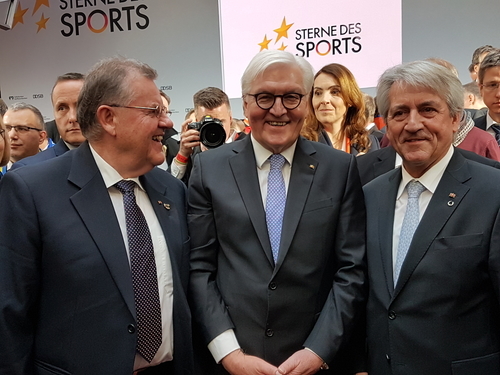 The awards to German clubs were made by the President of the Federal Republic of Germany, Frank-Walter Steinmeier, together with DOSB President Alfons Hörmann at a ceremony hosted by the German Volksbanken und Raiffeisenbanken. 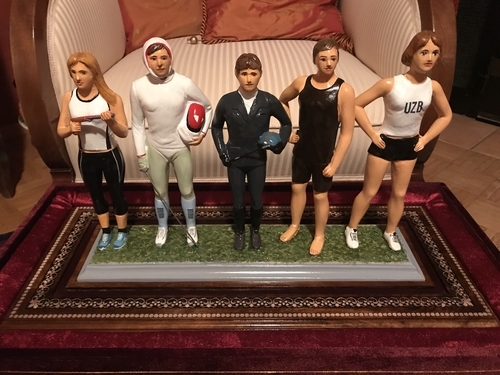 During his visit to Berlin, Dr Schormann met with representatives from business, politics and sport to discuss future actions of UIPM in the German capital. The UIPM President joined the New Year celebration of the DOSB in the Frankfurter Römer, where he attended the keynote speech ‘Sport and Social Institutions’ presented by the former German Minister of the Interior, Dr Thomas de Maiziere.